The Nuna Diaper Bag is designed to be discreet and sleek on the outside, and with every personal and parenting necessity on the inside. Why should I choose the Nuna Diaper Bag? The Nuna Diaper Bag is your best friend if you need a stylish yet spacious way to store your baby's paraphernalia. On the outside the Nuna Diaper Bag doesn't look like a baby's pushchair accessory bag all. However, on the inside it has all the space and sections you need. 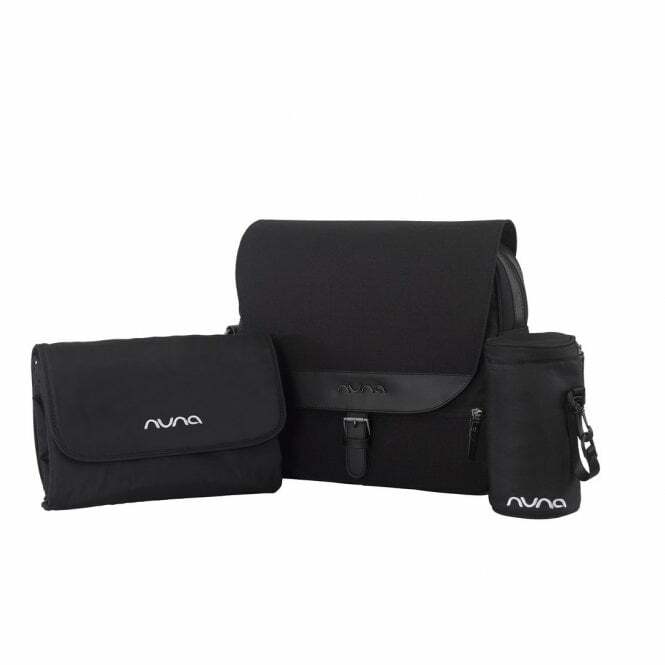 The Nuna Diaper bag has a strap so you can wear it across or over your shoulder. You can also wear it as a back pack. There is a built in sleeve which lets you carry the bag as luggage on a plane or train. It also fits laptops and tablets up to around 13" inches. This bag has a changing pad included as standard and you would never know all this from the outside! The leatherette handle and sleek design allow you to maintain the smart exterior you want to...but you still get all the benefits you need. Plus this bag has a useful bottle bag, insulated to help keep your baby's bottle hot or cold. The detail in the design of this bag is impressive and all for added convenience: There's a pocket for keeping wet items in - with a zipped top; you will also enjoy the magnetic clip to keep it closed, combined with a zip at the top. Over all, as well as 2 extra elastic bottle straps, the Nuna Diaper bag also has 7 handy mesh pockets. Therefore you can see what you've stuffed in them! If you don't already have one - why not treat yourself with this excellent gift idea?